Existing solutions rely on UAS strings, IP addresses and Humans. Access is easily faked, proxied and bypassed. Information is old and out of date when it is eventually acted upon. Humans cannot reliably track over 60,000 unique connections per minute (1000 per second!) as Data Portcullis does. Unreliable tracking basis – IP Addressing and port monitoring simply leads to detection rates that are no better than a wild guess. Data Portcullis can analyse incoming connections at a rate of over 60,000 per minute! For Data Portcullis, IP addressing and UAS strings are relatively unimportant. Some tests are based on identifying the actual unique device itself. Some tests examine device ‘behavior ’ i.e. they are not required to know anything about the device OR the IP address. Scrapers are blocked in real time before they scrape an itinerary, make a bid, buy a ticket, perform a transaction. Choose who and what to share your site with. Stop Website Attackers with Simple Filters! The following screenshot is an example of one of the Data Portcullis ‘filter control’ screens, where Data Portcullis users can precisely specify and adjust the filtering levels of some of the tests conducted in real time. 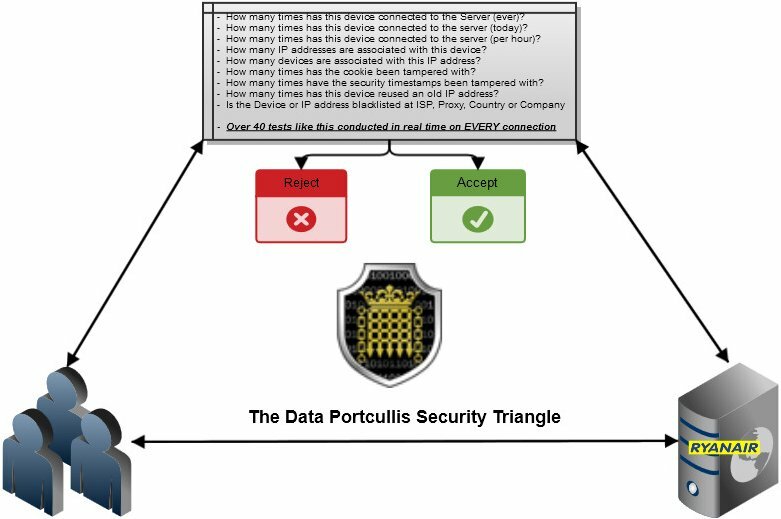 Once a website attacker exceeds the limits defined by the test, Data Portcullis automatically (and immediately) blocks their access to the Website. The sliders control the filtering level of test such as “how many times is a website visitor allowed to connect per day” (or per hour) and “how many tickets are they allowed to purchase” etc. The actual test names have been deliberately blurred out by request, but the below screenshot demonstrates the graphical simplicity and preciseness by which website attackers can be controlled.